SOIL constantly undergoes changes—be it by growing crops, adding fertilizer, erosion or contamination. Scientists analyse as many as 50 properties of soil—including sand and organic carbon content, porosity and essential nutrients like nitrogen and iron—to monitor its health and predict if the land is on the verge of degradation by soil erosion. Fertile land, for example, contains high amount of organic matter, nutrients and moisture, whereas eroded land fares poorly on the indicator scale. But checking a soil sample for all indicators is often cumbersome and time consuming. Researchers led by University of Agricultural Sciences in Bengaluru recently narrowed down the list and identified five indicators that can tell the soil health. The scientists examined soil samples collected from different areas in Kolar district of Karnataka, which faces severe erosion, and analysed them. Soil organic carbon, an indicator of the amount of carbon stored in the organic matter, showed the maximum variance from its ideal content in the soil. “Organic carbon is an integral part of the physical, chemical and biological properties of the soil. In any soil ecosystem a change in its content affects other soil properties. Therefore, organic carbon is the most reliable soil quality indicator,” the researchers noted in the September 25 issue of Current Science. Electrical conductivity, soil water, microaggregates and enzyme activity are other reliable soil quality indicators to monitor land degradation, said K Rajan of the Indian Council of Agricultural Research, the lead researcher. 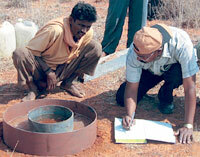 Subba Rao, director of the Indian Institute of Soil Science in Bhopal, said the finding is not universally applicable. Since the type of soil, extent of slope, location and rainfall also affect erosion, soil organic carbon can be used as an indicator at places where slope is less and rainfall is low, Rao said.